Let's be frank here: We've often said that fashion is art. It's a form of self expression, an opportunity to be innovative and imaginative, and a way to celebrate iconic style and themes. It's exciting, evolving, and — yes — pretty, but in reality, fashion is a business, too. A huge, $1.5 trillion business, and one that affects practically everyone on the planet who wears clothing they don't make themselves. It's for this reason that we're thrilled to see fellow fashion site, The Business of Fashion, nominated for 2013 Webby Award under the business blog category. Lined up next to other major online business publications, including Mashable, The Atlantic Business, All Things Digital, and Business Insider, BOF singlehandedly holds down the fashion fort in this category as the online destination dedicated to the side of the industry that resonates with the business world at large. 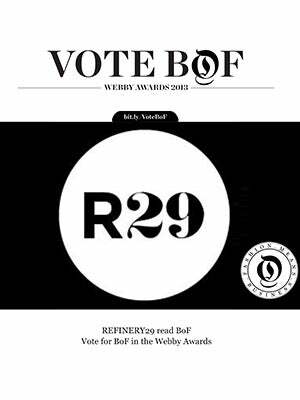 And because we care obsess about fashion, we'll be showing our support with a vote for BOF in hopes that it'll walk away with the Webby on May 21. Want to show your support, too? Place your vote here, and help the fashion industry gain recognition as the creative and business powerhouse that it is.